For additional information about this book, visit the website thewhyyoudo.com. Isn’t it time you understood why you do what you do? We’ve all heard the old adage “life doesn’t come with an instruction book,” but what if it did? What if there was a way to learn enough about yourself, and those around you, to really make success as easy as matching up slot A with slot B? Author Don Crosby wants us to realize all of our potential—not just doing what we’ve been told we should do, but all that we truly can do. His personal, humorous, and even touching stories will help you to understand how to become your own true, best self. At the same time, we all know that those around us—whether friends, family, or co-workers—can have a huge impact on our own potential. Crosby takes the time in The Why You Do to show how knowing more about the people around us can truly make life better—both at work, and at home. Crosby’s almost quarter century in the field has given him enough experience to help anyone navigate relationship dynamics. Backed by cutting-edge behavioral measurement technologies, however, these are not simply touchy-feely suggestions and ideas, but techniques you can use and apply. Broken into three helpful sections, The Why You Do will help readers learn who they are, how they fit into the world, and how to learn more about themselves—and others. 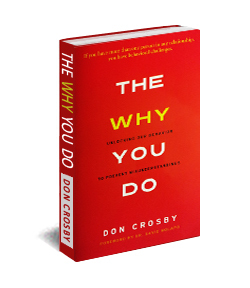 The why you do is a well-rounded compilation of life’s roles for the reader to reflect on their own occurrences to compare similarities in the diversity of life’s consequences. Beginning with a transparent snap-shot of the author’s biography, then moving into many common areas people have including dating, relationships, marriage, family, education, workplace, and church. The book moves from feeling heartfelt to self-help, encouragement touching on the many keys of human frustration. Even offering an interesting spiritual perspective that may inspire the reader to have a compelling understanding of how long we’ve walked in confusion. From these stories of humor and pain there is also an introduction to a technology that measures a person’s behavior very quickly and thoroughly. For the academic there is documentation from the inventor supporting why the tool is so appropriate to fit his description to The Why You Do. Don Crosby is Founder/CEO of Global Behavior Companies and known as the Behavioral Locksmith®. He has more than twenty-four years of consulting and training experience. During that time, Don has worked with small, medium, and Fortune 500 companies and assessed thousands of people.